The trip odometer and attendant features are not working on my recently acquired '97 8. The odometer displays the total miles but no pushing of the trip computer buttons effects any change. I just pulled the panel off (thanks Rev Sam) and the switch is plugged in, which I reseated a couple times just in case. Is there any other trouble shooting I can do, perhaps connect a couple of the pins? I see on eBay there are switches for sale but not the LJA6019AD that JEPC calls out and also is stated on my switch I'm looking at. Those switches have the clear button labled horizontally rather than vertically like mine and are LJA61019AB, not AD. Would one of those work if I didn't care about the orientation? And then of course there's the question if it truely is the switch and not the computer itself? Are you pressing the button on the end of the turn signal stalk to cycle through the functions? Another embarrasing moment, guess I should read the owners manual thoroughly, thx White! Relevant section from the Workshop Manual attached. I haven't included all the subsections so it'll probably raise many more questions but at least gives you an outline of the procedure. Thanks very much Graham, This was exactly the info I needed. 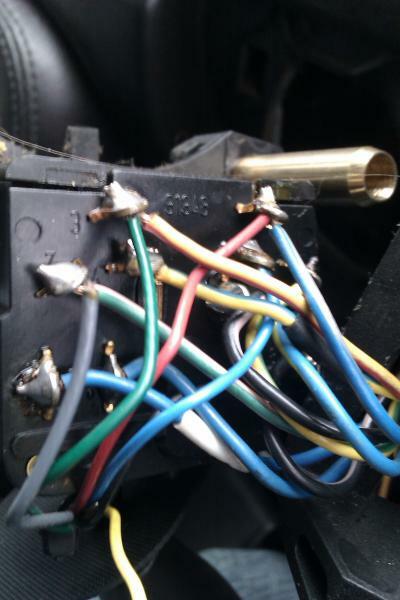 Just to add to this, you should have continuity between the yellow/black and black wires when the button is pressed. Thanks White XKR. Great looking car by the way and you obviously have good taste in music too! Having determined that the trip switch was OK I discovered a loose cable behind the indicator switchpack. Unfortunately there was no way of repairing this without removing the steering wheel to get to it. In the process, I managed to break another cable connection. I now have a grey wire and a yellow wire which come from the indicator stalk. I looked in JTIS but the colour scheme bore no relation to what I was seeing. I am hoping that somebody can tell me which contacts to solder these two cables to on the back of the switchpack. I have included a shot of the back of the switchpack. I can give details as to the colours of the wires currently connected if it would clarify. Any help in suggesting where I should stick my yellow and grey wires would be most welcome! Don't worry about replying my request for help from yesterday, I managed to fix it by deduction (all control switches pull the various control signals to logic ground anyway). How are the connections made on this switch - it looks like a copper saddle or clamp the wires slide through and are then soldered in place? Yes, these are copper eyes to which you solder the flying cores which exit from the indicator stalk at the bottom.